OneJet (Indianapolis) will add Nashville, Tennessee as a new destination city to its growing network. OneJet flights from Indianapolis International Airport (IND) and Nashville International Airport (BNA) will be available for purchase beginning August 13, 2015, for operation starting on September 8, 2015. Nashville joins a growing list of cities from Indianapolis offering OneJet service, including Milwaukee, Pittsburgh, and Memphis, all introduced earlier this year. OneJet flights will depart Indianapolis at 8:00am and arrive in Nashville at 8:15am. Flights from Nashville will depart at 4:15pm, arriving in Indianapolis at 6:40pm. All times local. Flights operate from main commercial terminals and airports in markets served currently including Indianapolis, Milwaukee, Pittsburgh, Memphis, and Nashville providing weekday service on Hawker 400 light jet aircraft. All flights are operated by regionally based operating partners featuring ARG/US Platinum Safety-rated and TSA-certified operations. Memphis was added on June 22. OneJet will announce a second focus city on or before September 15. This entry was posted in OneJet and tagged Indianapolis, indianapolis international airport, Nashville, Nashville International Airport, OneJet, Tennessee on August 14, 2015 by Bruce Drum. OneJet is launching scheduled passenger service from Indianapolis to Milwaukee with Hawk 400 jet aircraft on April 6. This will be the first scheduled route for this upstart. The new service will operate four days a week and will use the J1 code. Flights are operated by Pentastar Aviation Charter Inc., subject to DOT Part 380 regulations. This entry was posted in OneJet and tagged Indianapolis, Milwaukee, OneJet, Pentastar Aviation Charter Inc. on March 20, 2015 by Bruce Drum. 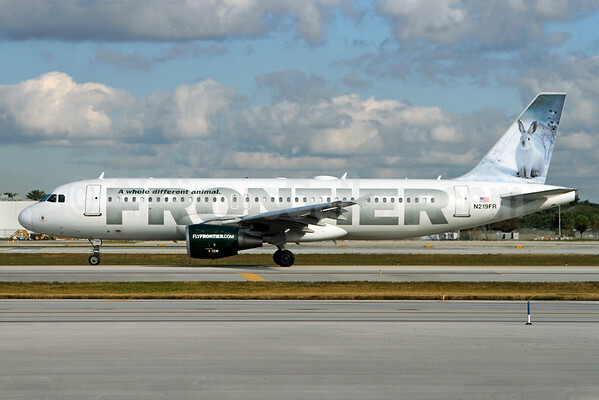 Frontier Airlines (2nd) (Denver) is expanding operations at Atlanta while it downsizes its Denver hub. 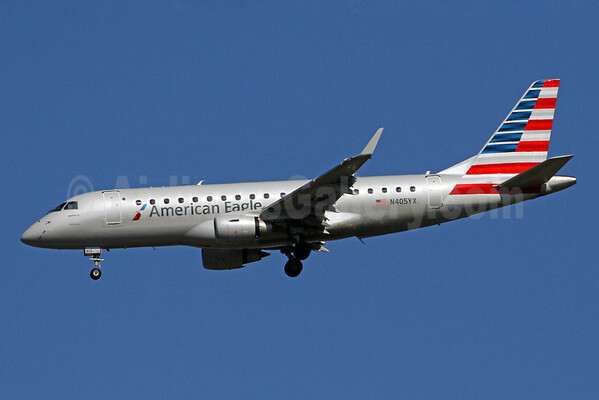 On March 6 the ultra low fare airline will add new routes to Austin, Indianapolis and Miami. Copyright Photo: Brian McDonough/AirlinersGallery.com. Airbus A320-214 N219FR (msn 1860) with Jack, the hare, taxies to runway 10L at Fort Lauderdale-Hollywood International Airport. This entry was posted in Frontier Airlines (2nd) and tagged 1860, A320, A320-200, A320-214, Airbus, Airbus A320, Airbus A320-200, Airbus A320-214, Atlanta, Austin, FLL, fort lauderdale hollywood international airport, Fort Lauderdale/Hollywood, Fort Lauderdale/Hollywood International Airport, Frontier Airlines, Indianapolis, Miami, N219FR on February 4, 2015 by Bruce Drum. 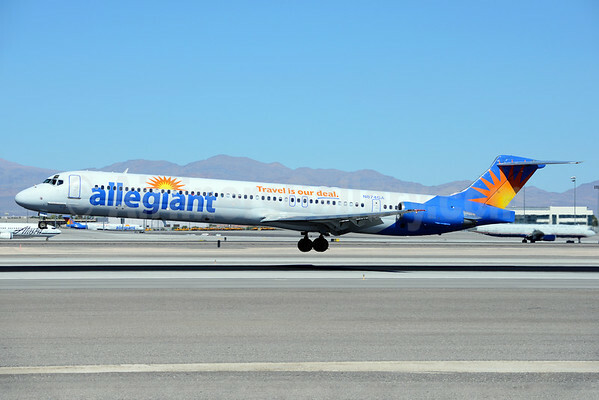 Allegiant Air (Las Vegas) has announced new nonstop service to New Orleans, the carrier’s newest destination. Seasonal service between New Orleans and Cincinnati, Columbus and Indianapolis, and year-round service between Sanford (near Orlando), will begin in early February. The new flights will all operate twice weekly. Copyright Photo: Ton Jochems/AirlinersGallery.com. McDonnell Douglas DC-9-83 (MD-83) N874GA (msn 49643) arrives in Las Vegas. 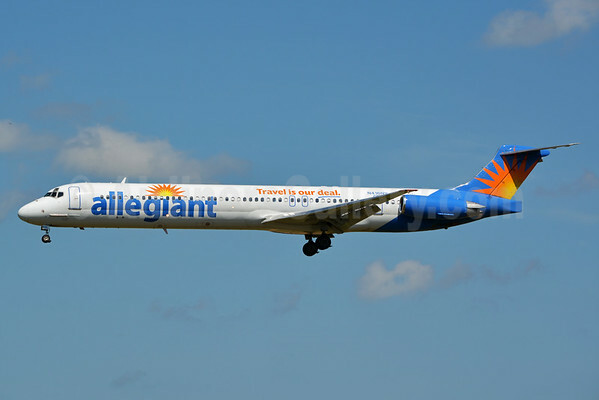 This entry was posted in Allegiant Air and tagged 49643, Allegiant Air, Cincinnati, Columbus, DC-9, DC-9-83, Indianapolis, LAS, Las Vegas, Las Vegas McCarran International Airport, louis armstrong new orleans international airport, McDonnell, McDonnell Douglas DC-9, McDonnell Douglas DC-9-83, McDonnell Douglas MD-83, MD-83, N874GA, New Orleans, Sanford on November 19, 2014 by Bruce Drum.